The AGV AX-8 EVO is like a shapeshifter of motorcycle destiny; it comes in many forms. 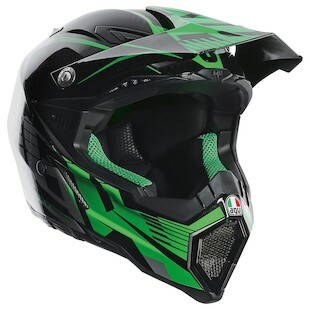 Whether you ride exclusively off-road, prefer Dual Sporting, or ride on the street but flat out dig the angular look of more dirt-inspired helmets, there is an AX-8 EVO for you. 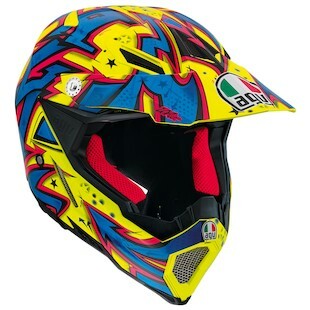 Speaking to those who are all about the former, the AGV AX-8 EVO for motocross just got 2 new graphical updates for 2016. Starting with the AGV AX-8 EVO Carbotech Helmet, we see a seriously aggressive look that pulls the eye front-to-back with a vengeful force. This graphic is jagged. It is ripped. It is sharp. And it is for riders who tear through the off-road in much the same way. The choice between White/Red and Green/Black is the only thing that is not for certain about this helmet, as the Carbotech graphic is on that “not messing around” crew. Braap-braap is business, and the Carbotech helmet comes to the market with its MBA. On a more playful side, the AGV AX-8 EVO Spray Helmet is also new for 2016. With a design aesthetic that could have been taken right out of the mix-tape art for the classic of cinematic wonderment, Crush Groove, the AX-8 EVO Spray graphic is incredibly vibrant. As the name would suggest, the aesthetic of the Spray helmet was inspired by the graffiti purveyors who stand as the quintessential embodiments of rebellious artistry. It is an ethos that goes well with the masters of motocross and oracles of the off-road. So, in summation, the AX-8 EVO is a great off-road helmet, and for 2016 it is getting a couple cool new graphics.